Those of you who remember MeasureMap are long time readers of this blog. It was a blog-centered analytics service that first surfaced in August 2005. The service was created by San Francisco based Adaptive Path. The first details emerged in October 2005. 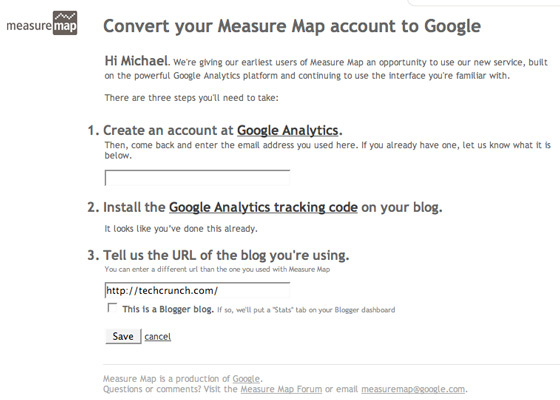 It was Google Analytics but just for blogs. It told you stats based on posts and other key blog features. By November 2005 Google had copied some of the features. And a couple of months later, before MeasureMap had even officially launched, they just bought it outright. Since then, nothing. Founder Jeffrey Veen became the User Experience Manager and has been associated with a number of projects. Measure Map simply faded and was forgotten. we’ve since rebuilt Measure Map from the ground up. I’m emailing Google now to see if they’ll give more details on the planned launch and how it will be different from Google Analytics.